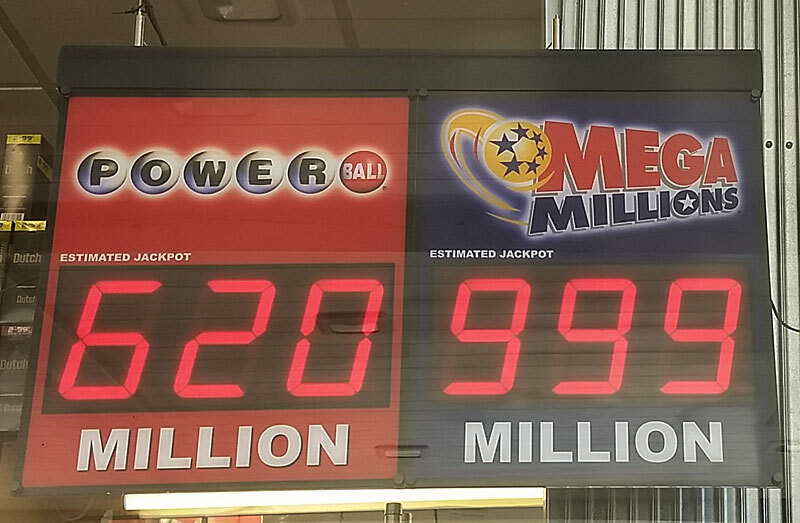 Retail signs only go up to $999 million, despite the $1.6 billion Mega Millions jackpot. 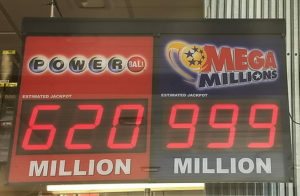 Everyone will be clutching their tickets once again tonight hoping to see the numbers that will bring them the $1.6 billion Mega Millions jackpot. The Powerball jackpot has also gone unclaimed for weeks and is estimated at $620 million. Neubauer says you should take the same approach whether its Mega Millions or Powerball. “Have fun daydreaming about what you might do with the money, but remember that there’s no guarantee that you’ll win the jackpot,” Neubauer says. Neubauer says Iowa isn’t a state where you see long lines of people waiting to buy tickets because our population isn’t as big as some other states. But, she says sales have been brisk and kept retailers busy. “Our center that takes calls from our retailers is being bombarded with calls for more paper right now, because obviously retailers are printing so many tickets that they are going through paper at a really fast clip in their lottery terminals. So, we are getting paper out to them,” according to Neubauer. And the large Mega Millions jackpot has some retailers being creative in keeping track of the numbers. “And so you’re see just a lot of handwritten signs where people are kind of x-ing over the word million and writing in billion,” Neubauer says. “You know what, that’s fine, it doesn’t all need to look perfect. We’re just trying to get the word out there.” The final estimated jackpots could change again for both drawings if ticket sales continue to be brisk. “With sales as high as they are around the country sometimes even our best estimates fall behind the times. So, every day we are analyzing sales figures to see of the jackpot needs to be raised again,” she says. She says there are cases where a group winning a jackpot turned into a lawsuit because it was unclear who contributed — and who gets a share of the prize. “When money is involved, sometimes tempers can flare, and we just wouldn’t want to see that happen. We want this to be a fun thing. Not something that makes someone mad,” Neubauer says. She says they have tips for keeping track of group purchases on their website. The deadline to buy a Mega Millions ticket for today’s drawing is 8:59 p.m. The deadline to buy a Powerball ticket is 8:59 p.m. Wednesday.